PRODUCT: 24" WIDE SERRATED 3/8" (V-notched) BLACK NEOPRENE RUBBER BLADE, STRAIGHT SQUEEGE. SET IN STEEL FRAME. BLADE CAN BE REPLACED IN FRAME. 6/CARTON. PRICE/CARTON. APPLICATIONS: Petroleum resistant, flexible black NEOPRENE blade with serrated edge allow optimal flexibility and control of material deposit through pressuure, angle and options of notches. Uses 1-1/8" diameter tapered handle, not included. Serrations: also available with no-notch, 3/16", 1/4", 3/8 and 1/2" V-serrations. 6' x 1-1/8 in. DIAMETER HEAVY-DUTY HARDWOOD BROOM / UTILITY HANDLE, TAPERED-END. 12/CARTON. PRICE/CARTON. 24 X 1/4 INCH SERRATED SQUEEGEE REFILLS, BLACK NEOPRENE. 6/BOX. PRICE/BOX. Telescoping (Extendable) Fiberglass Handle 3 to 6 ft., Super Strong 1-1/4 in. diameter with DUAL Threaded and Tapered Tip. 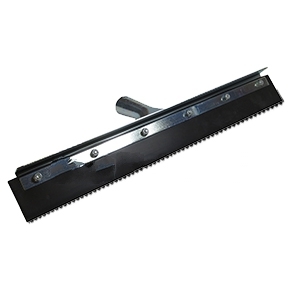 Fits squeegees, brooms and common hand tools. Design is inexpensive to ship and easy to store. Price/Each. Telescoping (Extendable) Fiberglass Handle, 3 to 6 Foot, Super Strong 1-1/4 in. diameter with Cast Metal Screw Tip. Fits common hand tools. Compressed design is inexpensive to ship; easy to store. Price/Each. Telescoping (Extendable) Fiberglass Handle 4 to 8 foot, Super Strong 1-1/4 in. diameter with Cast Metal Screw Tip. Fits common hand tools. Price/Each. Threaded-To-Taper Broom Handle Tip, Nylon. Screws on Threaded Broom Handle to Enable Use with Tapered Tip Items. Price/Each.